Parathas are always loved by al at home. I normally make aloo paratha for kids lunch box or even for dinner. 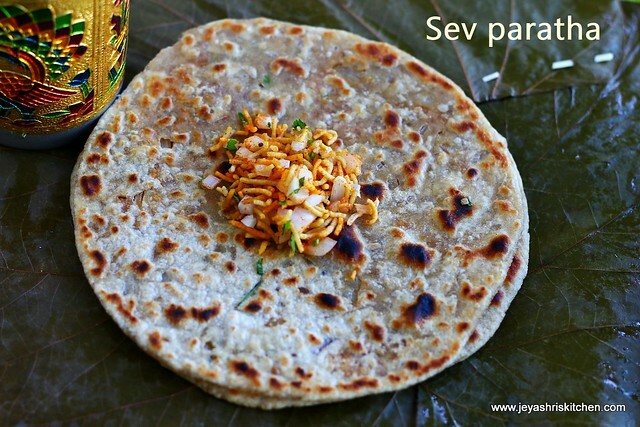 This sev paratha recipe i have seen in chef at large forum in facebook. The paratha recipe was posted by a blogger. I tried this few months back. 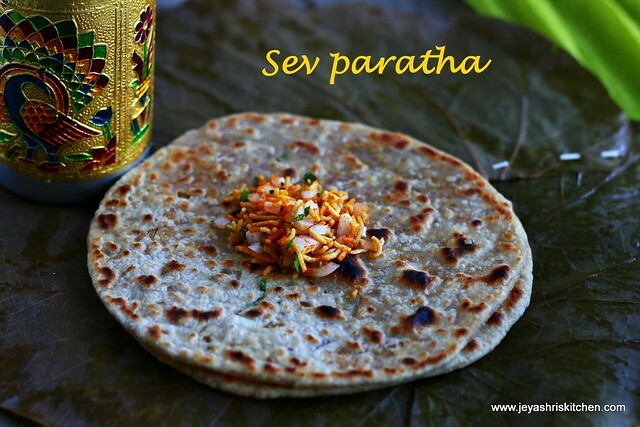 Today when i saw little sev left over in the packet i thought i will make this paratha and post it here. This tasted very awesome. A spicy paratha with a glass full of punjabi sweet lassi was my lunch today. I adapted the recipe from here. 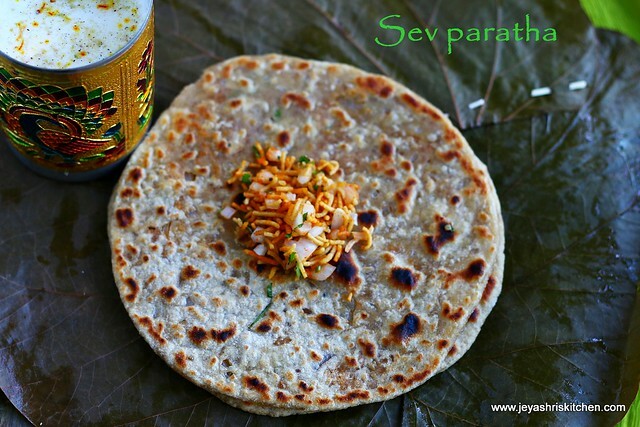 Even if you don't have any veggies at home, you can make this sev paratha at home. Knead the atta into a pliable dough. Keep it aside. In a plate add the sev, red chili powder, chaat masala, finely chopped onion and coriander leaves and salt. Mix it well. I used haldirams bhujia . So added little less spices. If adding nylon sev or plain omapodi , add little more of red chili powder and extra pinch of chaat masala. Divide the dough into 5 big lemon sized equal parts. Take one ball and roll it into small thick disc. Place 1 and 1/2 tblsp of sev filling in the center and carefully close it. Dust the rolling surface with flour and start rolling the parathas. Heat the tawa and cook the paratha on both sides. When cooked on both sides add oil| ghee|butter to the paratha. If using plain sev add little more of red chili powder and chaat masala. Adding mint leaves to the filing also enhances the taste. You can add little jeera powder or coriander powder to the filling. Do not worry if the filling is left over, you can have this as it is. Parathas were easy to roll and the filing didin't come out while rolling. Add onions to the filling in the last. Else this will make the filling very soggy. If you don't have sev you can roast a papad and make them into fine pices and replace instead of sev.